The UK version of our site conducted a bit of research over the last one and a half weeks. 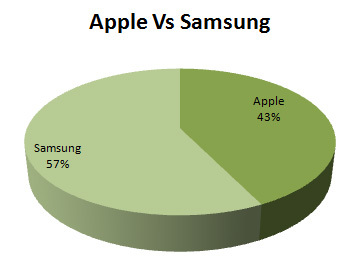 On October 8th they ran a poll on their Facebook page called “Are You On The Side of Team Samsung or Team Apple”. The aim was to see, that despite all the publicity that Apple have had in recent years and the enthusiastic following they have, if indeed they were the preferred company. The results were certainly jaw-dropping (for me at least), as I thought Apple would be clear winners in this poll, oh how wrong I was! Overall since the poll started there have been 2,565 votes (at the time of writing) of which Samsung make up 1,467, whilst Apple trail behind with 1,098 of the votes. You can see that there is a noteworthy difference here between the two companies. What are your thoughts on this then, do you think Apple are losing their grip at the top?